It being ALA - Library Advocacy day 6-29-10 ... I'm feeling happy. I want to give this ARC out to ONE lucky Mortal Instruments fan. NEW follower ( Please specify if one of our followers have referred you to us! Give us there name... you will get earn 5 EXTRA points! ) - 5 pt. *** If you get someone to follow us and they comment saying you sent them here - I will give YOU, a previous follower 10 pts. Follow Andye ( Reading Teen ) on Twitter - 5 pts. Follow Amy ( ReadingTeen 2 ) on Twitter - 5 pts. Follow Kit_Nichole on Twitter - 5 pts. **** BY THE WAY... If you leave a comment telling me WHY Libraries are so important to their community I will add 10 pts to your total. I will announce the WINNER Friday at 12am. You will have 24 hours to email me at amy@readingteen.net with your address. SO keep working until Friday midnight - don't fizzle out. This book is worth it!!! Thank you @flamingo1325 your so very cool! As a Librarian-in-Training (I'm working on my MLIS right now) I see how important Librarians and Libraries are first hand every day. Not only do they open worlds up to people through books and information, but they bring communities together, offering a place for people to come learn and interact with each other. For example, offering ESL classes to those that need it, providing reading time to kids just starting to read, offering a place for teens to come hang out (instead of getting in trouble lol) through teen groups, and so much more. I could go on and on and on, being a Librarian. Libraries are the cornerstone of a community. Libraries are so important for communities. We recently fought in my town to open up a new library. It took a long time to collect the funds but now it is open and is serving so many children in the area. For low income homes, libraries may be the only way they can get books in the household. Plus it may help keep older kids out of trouble. They try to incorporate a lot of activities for all age groups to make it a place children want to go to. The librarians are willing to work with children individually and show them how to make the most of the tools they now have. 15 + 1=16 points. Why libraries are important, below=10 points. TOTAL=26 points. Libraries are an essential part of every community not only because they provide books, but because they provide services. My state has been decimated by unemployment, and libraries provide free computer use for people to search for work, create and post resumes, and network. In addition, my local library has free computer and job search classes. The library is a place where people can, through books, videos and other media, computers, and services, put shattered lives back together and move forward with hope and support. 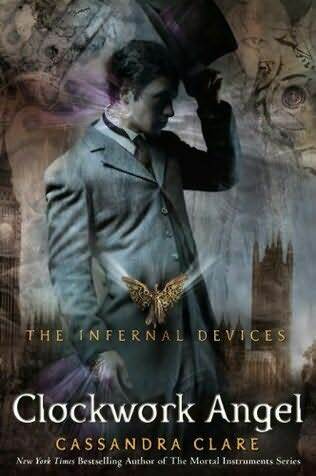 CLOCKWORK ANGEL!!!! I'm so excited to read this one!!! +10 I think libraries are so important because they provide access to books for the community at no charge. I know that a lot of people in my town wouldn't be able to read many books without our public library. Books are expensive, and it's wonderful that there's a system where people can share and enhance their love of reading! +10 I feel that the library near my home was bigger and had a better selection of books. Not many people go there I think. And if not many people, book lovers don't get the chance to meet like-minded people from the same community! Why? Just to share and discuss about the books they read as well as to make new friends! That's what I think. Thanks! Thanks for this awesome giveaway! I love you guys! Libraries are one of the most important places in their communities because it is a place where others can go and escape from all of the daily problems that they may face and enter into a whole nother world in the library. I know for me personally, if it wasn't for my local library, I wouldn't love reading, review books on my book blog, or enjoy and look forward to meeting authors who have become role models in my life. Sorry my comment is so long :D Thanks again guys! +10: Why Libraries are important to communities. Hello, I want to participate in this contest. Libraries are so important to communities because there are a lot of people that don´t have money to buy books. They can go to the library and have any book free. I think culture must be free for every men or women, childhood...I am librarian too, and I love this job. the comment in your bloog with nick "Mandarina" telling why libraries are importants to my country. --> 10 pts. I follow all three of you on Twitter! What a cool give away im dying to read this! I didn't know that two of you were on Twitter! And I've been a follower of Reading Teen forever! (well, as long as I knew it existed) But I follow everyone on Twitter now (I'm @Figment527). Everyone should have an @reply from me advertising this contest. Libraries are important for so many reasons - they serve as gathering places, meeting places, and general resources for groups. They serve people who don't have access to the internet in their homes - which is important for job searches, social services, and getting general information. They also serve as a safe hang out for kids who would otherwise be out on the streets. Libraries introduce people from all walks of life to each other, they serve as a way for the community at large to get free information and sometimes even learn a new skill. A good kids program can introduce young people to books and create life long readers and information seekers. A really good library can even be a tourist draw and a boost to the local economy. The list just goes on and on. Awesome giveaway btw! And super jealous I'm not in DC today. Libraries are important to the community because it exposes everyone to the wonderful joy of reading. It's open to everyone. No matter the subject you can find a book. Plus it's free. Thanks for the giveaway! I'm looking forward to this book! I think libraries are very important for the community because not everyone has the money to go and buy books and libraries are excellent for that, you can go in there and check out tons of books or request the ones you are interested in if they don't have them. It also encourages kids to read and during the summer they have excellent programs for children and teens which I love. +10 Libraries are important because it exposes people to learning new things. It is a great place to broaden knowledge and/or discovering new authors. There is something for everyone at a library so it is a great place to get kids interested in reading. I WANT THIS SOOOO BAAAAAAAAAAAD! so that makes: +15 correct? Libraries are important because of them, people have books to read. I always go to the library, because my parents can't drive me to the bookstore. Always, the bookstores don't have some books that i need to read for school. +15 I follow the three of you! +10 Libraries play a major role in the community as well as in the academic setting. It's not only a place where books are stored. It's also a place where students, as well as people who want to learn and read go. It's a place that nourishes the brain with information, as well as literary escapades such as novels (Ahem, YA novels) that pluck readers away from reality and transport them somewhere else. It's also a place where one can muse and think. The silence aids in brain activity - this can be very useful when it comes to doing homework, reviewing for exams and writing. Most importantly, the library is an essential structure that holds and keeps a whole set of knowledge and stories available for every single citizen. +10 A lot of parents in this tight economy cannot spend the money to buy books- books-food? books-food? Food is going to win out every day. Books nourish another need and if libraries were not there to feed this need, the human mind would dry and wither as surely as the body would from a lack of food. MundiMoms helped me to follow you! "One must always be careful with books," said Tessa, "and what is inside them, for words have the power to change us." "I'm not sure a book has ever changed me," said Will. "Well, these is one volume that promises to teach one how to turn oneself into an entire flock of sheep-"
"Only the very weak-minded refuse to be influenced by literature and poetry," said Tessa. (+10) I think libraries are EXTREMELY IMPORTANT to the communities, because reading is such an important thing for the youth to do, concentrating in reading and having fun with a good book instead of being on the streets doing nothing, wasting their time and MINDS, and they say people often don't appreciate what they have and I think they're right because I live in Mexico and I don't have the luxury people in the US have of simply going to the nearest library and get to read a book for free; and I see how difficult it is to get young ones to read something, here in Mexico nobody ever reads and a nation that reads it's a nation that progresses; so you people in the states should be really proud and appreciative of that amazing luxury of having libraries. Librarians are great help in referencing and helping patrons. They rock. +10 Libraries are important to the community not only because it is a storage of books but also a place to meet like minded people. It is a source of knowledge,fun,entertainment. There are many people in the world who cannot afford to spend lavishly on books. But they love to read! Libraries are perfect for them. Librarians also have the best recommendations! +10 - The library near me isn't very big but without it, I would've never been able to read the Diary of Anne Frank for school. My town isn't exactly the richest either, so there are many people who can't even afford to buy a paperback from a bookstore. The library provides a free way to enjoy books, and I think it's important for people, teens especially, to be able to read. To be denied a book for any reason at all is wrong. I remember the library at the middle school in my previous town denied entry to any students who had one D on their report card, and there was no other library in the town so many students went without a book to read. I still can't believe that they're allowed to do that. Aside from that, I have many wonder memories of going to the county library and sitting on the floor of the children's section, for the longest time. :) Libraries are one of the most important assets to towns today, especially ones with high poverty rates, because everyone has the right to read, no matter their siuation, and libraries represent that. Great contest. I loved the Mortal Instruments series and I cant wait to read this book. I'm a new follower and I was referred by Throughthehaze. Thanks for the chance to win this one. I follow ReadingTeen on twitter (CazApr1) and really enjoyed the Mortal Instruments books so far - so did a lot of the kids in my Library - I'm a School Librarian in a school that has a lot of children with 'difficult' home lives, meaning their parents are unlikely to have either the money or inclination to buy many books, so my Library is so important to their educational, social and emotional development! I also meant to say that I tweeted too!! Librarians are important because they provide an amazing opportunity for people to discover reading or to branch out their taste in books, especially disadvantaged people that would not be able to afford books any other way. They widen people's horizons and make life more enjoyable! Libraries greatly encourage reading and learning from a young age. I was greatly inspired in my choice of what I want to do in life because of the many books I read, and that all started when I was too young to read, and would simply pull out books at the library to look at the pictures. I think anyone who reads frequently will be much more learned than normal, and more successful in life. Libraries provide a way to gain this. +10 Libraries are important because you can read books free and there you can find more books with a similar theme to the ones you like. New follower referred by Kari (Flamingo1325) of A Good Addiction. +10 Libraries are extremely important: I can say with personal experience that if I didn't have mine around, I wouldn't have been able to read almost every book I've read thus far. Sure, I can buy books or borrow them from friends but I get almost everything at my library. (it's my personal heaven!) My library also offers a bunch of great activities and it's a wonderful place to connect with people... and did I mention all these servies are free? lol. +10 - Libraries are so important - well, one if we didn't have them I would have no job, which is huge probably only to me and mine, but huge just the same. On a more serious note - libraries are important because they give everyone the same opportunity to have access to not only great books, but so many other media and information. They level the playing field a little for the masses, everyone has the same chance to get great reads! You ladies are SO AWESOME for hosting this giveaway. What an amazing gift it will be for the winner. Woot! +10 Libraries are important to communities because they represent the knowledge that humans have uncovered throughout history, they offer a gathering place for people of all walks of life to actually be equals and interact as such, they bring people of similar interests together to discuss such interests, they help illiterate people learn to read, and they allow anyone to open a book and read it, regardless of their financial status. Finally, they bring together families and give them an opportunity to bond. Going to the library with my mom is some of my favorite childhood memories. I REALLLLLLLY want to read this. I am a huge MI fan and I have been waiting for this for what seems like forever. +10 Libraries are important because they open the written world up to everyone, which is the way it should be. To be able to walk into a library, grab a book, and just start reading is magical in itself. Thank you so much for this super awesome contest! +10 Libraries are fantastic and important because they give everyone a chance to read books, especially those who may not have a chance otherwise. Our library adds a lot to our community with programs and story times, etc. - I am an old follower but Alannah (http://allyversustime.blogspot.com) referred me to this blog. - I tweeted about it. - Libraries are fundamental to communities because they open a world of knowledge to their members. Libraries share books filled with all kinds of information, they make it easier for us to learn, and learning is ALWAYS going to be important to human nature, we need to learn in order to live. - I referred Justine to the blog. +10 Libraries are very important for the community because without them we wont have access to a lot of things. Such as, books, newspapers, movies, videos, etc. You can pretty much find anything at the library. You also have access to computers at the library and that comes in handy for students away at college who sometimes don't have a computer or lap top. You can print, fax and copy things at the library as well. There are so many people who live in a small town and don't really have access to certain books or a book store in their town period. With a library they have access to books and for free. I honestly feel that without a library in our community we would miss out on a lot. Also, I just started following your blog on the 24th so I am not sure if you would consider that a new follower or not. I'm a new follower came here via Good Choice Reading (tweet). I think libraries offer so much to the community - a place for reserach, a quiet place to read, internet access for those who don't have it in their homes, programs to encourage children to read, summer reading programs for adults and so much more - I adore my library. ** If you get someone to follow us and they comment saying you sent them here - I will give YOU, a previous follower 10 pts. I've added these to my twitter as well for Kari (flamingo1325). NEW follower (Lena sent me) - 5 pt. I am AineFey on twitter. Libraries are important to every community. There are people who don't have money to buy books. There are people who don't have enough to buy computers and/or have an internet connection. For those people, libraries are extra important. It's also a way to get info about upcoming books, meet authors as signings, have book clubs. Libraries are great places, and they need support to continue to run free. +10 Our library is important to our community simply because we live on an island. Here there are only two little book stores and usually they don't have the book your looking for. We can go to our library here and if by chance they don't carry the book, we can go online and have the book actually shipping to the island from another library for free. It also gives us a place to escape to since there's nothing really here to do, plus the best part is that its free. Kari referred me (flamingo1325) so give her 10 points. Libraries are what got me reading as a kid. My mom would take us and we'd pick out books and take them home. All week, we'd have a new story to listen to at bedtime. When I got older, I devoured a series I coin "the Betsy books". And today, I'm an author, so there! We need libraries. I'm following all three (brendapandos) 15 points I'm a new follower 10 pts and 10 for the library thing. so, 35 points total, I think. I'm a crazy stalker- so of course I follow all three. Libraries are important for one very important reason: it brings books and education into neighbors with lower income families that can't breeze into B&N and buy a $15 book. Imagination is key for our children and libraries fostered that for our parents and grandparents and will be there for my children and grandchildren. I was sent by Kari @flamingo1325 and am not a follower! I lived at my local library when I was a kid. It was so big, I used to think it was a castle :) It got me to love shakespeare (they did mini-plays) and the librarian was always so nice to me! My favorite thing was to curl up in one of the huge squishy chairs and read for hours on end! Eventually, the library inspired me to start creating stories of my own... I'm now a writer! Libraries inspire people, young and old. Plus, you can never have too many books! I have been dying for this book. +5 I am an old follower (skyla11377). +5 I already follow Andye (Reading Teen) on Twitter (@skyla11377). +5 I am following Amy (ReadingTeen 2) on Twitter on Twitter (@skyla11377). +5 I already follow Kit_Nichole on Twitter on Twitter (@skyla11377). +1 I Tweeted About This Giveaway On Twitter (@skyla11377). +10 Libraries are a good source of education and entertainment. Were else can a child let their imagination roam free with an endless amount of books. Libraries help to foster creative minds in children, in my opinion. When I was in high school my friends and I would hang out a the Library like once a week doing our homework and browsing through all the books.Those are some of my fondest memories. Libraries help to develope the writers of tomorrow. I posted a blog about this giveaway (skyla11377). Libraries are important for SO many reasons! While the internet is a great resource, you are much more likely to be led astray--And we should not let ourselves become overly dependent on it without other sources such as books. And while a great many books are being converted into digital format, there are still so many that haven't been converted yet and it would be a shame to loose them. Many libraries also provide the internet usage as a tool, but the greatest resource of all is a good librarian who can guide you in the right direction. I am a person who prefers to buy rather than borrow, but with so many great books available, that can be very expensive, which makes the library a more affordable option. I've also lived in many places that don't have book stores easily accessible, but there is always a library. I fear that so many references and tools that we can't even imagine would disappear without libraries, or become lost in the overflow of the internet. I think it would be a very sad place without libraries. +5Follow Kit_Nichole on Twitter - 5 pts. +10 Comment on why libraries are important!! This is one of the best blog concepts I've ever seen. Brava! I haven't read much YA, but need to start. Think I'll start with Sea. It sounds compelling. Thanks! I was sent here by Kari (Flamingo1325)...she is one of your strongest advocates on Twitter!!! I think Libraries are important to any community because they let people read books for free. I know friends who love to read and don't really have the money to buy a lot of books. Libraries also bring people in a community together. When the library has reading time or some other project going on, the parents can come meet when they bring their kids! Libraries - +10: Not all of us are lucky enough to be able to run out to the bookstore to pick up a book whenever the fancy strikes us. The library gives everyone the opportunity to find that book that will allow them to escape to another world or teach them something new. It's a place to find a new friend and to learn about who you are. Without the librarians who work there, how would we find our way in the land of books? They are there to be our guides and show us the direction to go so that we may reach the place we long to be. In addition to the aforementioned 31 points (15 for Twitter, 5 for following, 10 for the library post and 1 for tweeting) I also claim my extra 30 points for following on my other two accounts, @irritatingbear and @Mmarymonkey. @alicefly167 is the account I first followed on. Now, back to tweeting! Libraries are important because I have to say that I think the majority of people can't afford to buy books very often. Libraries provide books for those people (me included) so they have a variety to read. They are also great for children as a place to learn at storytime, play time, and computer time. It's a place I went several times a week as a kid and as an adult I bring my children once a week. I can't even imagine not having a library to go to. I'm so excited about this book! It's my most highly anticipated book of the year for sure! Thanks so much for the contest! (Kari (Flamingo1325)) sent me :) I REALLY want her to win she deserves it 100% percent. Libraries are important they provide a good escape for both kids and adults. The provide the channel by which u could get a book and travel to an alternative universe, fall in love, said the high seas. Limitless possibilities exist because libraries exist. Hiya! No need to enter me just wanted to tell ya kari from a good addiction sent me and I now follow you. However no need to enter me in the contest...great blog though! I had 42 points in total. I don't know if all of them count, but if they do the total is 178 points. So. Apparently I went over my limit on twitter. So... I guess syou can hit it. I think its 100 in an hour lol. Oops. New points from twitter is 119. I forget how many I had before, but it's posted somewhere up there.and that's total points, not posts. Okay. Chicadee819 hijacking has been maxed out too... but, before it did... total points to add to everyhting else is 244. And with that, I be done. 43 posts on Twitter 10 of which I told someone to Follow (?) 15 points for following all three and 10 for posting the importance of libraries! I'm new to this so I'm not sure if I am calculating this right...The kids in my innercity literacy program want this book so bad!!!!! !